Ojai State Bank. This remarkable building, with its classical columns, was constructed in 1910 and retained that name until it was purchased by the Bank of Italy in 1927 (subsequently, the Bank of America). Even while the businesses of the town of Nordhoff had the appearance of any frontier western town, with wooden false fronts, this elegant building stood facing them across the street. It was razed in 1960. 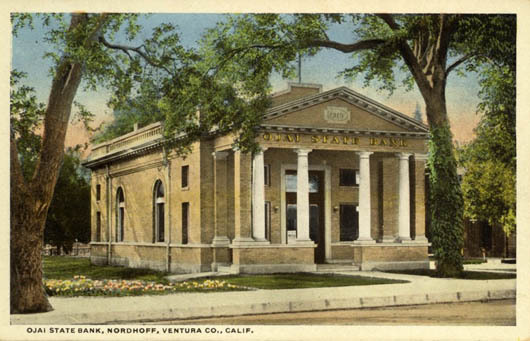 The Ojai State Bank was designed by Silas R. Burns, a partner of Sumner Hunt. Together they designed the Glen Tavern Inn in Santa Paula, the Southwest Museum in Pasadena, and the Automobile Club in Los Angeles. In 1916 the bank was robbed by a local man. He wore a mask, but the teller recognized his boots. It’s hard to get away with anything in a small town like Ojai! It is a shame that this beautiful building is no longer part of our city. It is always sad when historical buildings are razed for something more modern and we call it progress!! I agree with you! I’m an Ojai native and was about nine years old when the bank was razed. So, I remember it. It was a magnificient building with heavy, distinct architecture. I recall thinking how different it looked than the Arcade just across Ojai Avenue. My maternal grandmother (Margaret “Peg” Wells) and my mother (Arlou Mashburn) moved to the Ojai Valley in the late-1940’s. My grandmother was an employee at the “Hickey Brothers Department Store” (later “Rains Dept. Store”) across the street from the Bank of America. My grandmother (“Magee” as the family called her) passed away in 1993. I was the executor of her estate. Therefore, I had to go through all of her belongings. In doing so, I came across her old savings deposit books. My grandmother lived through the Great Depression. So, like a lot of folks of the generation who lived through the depression, she got rid of few items. Many of the bank savings deposit books were from the Bank of America. In my grandmother’s savings deposit books, were deposits as small as two cents! A large deposit would have been two dollars. But, remember, these deposits were made in the late-1940’s through the 1950’s by a lady earning a small hourly wage as a sales clerk. I can just visualize Magee leaving Hickey Brothers/Rains on one of her breaks, then using the crosswalk to go to the bank to make one of her many deposits. How cool it that?!!?? ?